It's 8:30 p.m. and my patience is nearly gone. Put to bed an hour earlier, Kate now stands in front of me wailing, her face red and tear-streaked, sobbing so loudly her words are impossible to discern. Marshaling every bit of civility I have left, I offer a hug and firmly tell her that I won't tuck her in again, that her body needs rest, that she needs to get back in bed quickly or she'll have to take a nap tomorrow. "Now," I say, "what did you need to tell me so badly?" She sobs harder. "I CAN'T REMEMBER," she bellows, her nightly refrain when she runs out of other ways to stall bedtime. I take a deep breath, frustration rumbling beneath my skin. "Get back in bed, please." "Will you watch me from the hallway?" she begs. As per our elaborate system of family bedtime rules—built up over her five years of life as a stubborn sleeper—I shake my head. Her crying takes on a new edge of hysteria as she contemplates the hallway in front of her, the darkness of her bedroom at the end of it. Her fear rolls off her in waves, so visceral and real that I feel it in the place beneath my ribcage where the part of me that will always be a frightened little girl sits. But rules are rules, and it didn't take me long to learn that this child will devour every concession given and still never be satisfied. Her sobs recede down the hallway as she hits the doorway of her darkened bedroom and makes a running leap to the bed, where she can cuddle her stuffed elephant under the comforter until, at last, sleep takes her. When I was six, I was afraid of everything. My childish nighttime prayers included a long list of the things I fervently needed God to protect me from as I slept: rampaging wolves, Grizzly bears, tornadoes, fires, earthquakes, the eeriness of my own closet once the lights went out. When I was Kate's age, my mom read me the story of the Mexican volcano Parícutin, a cinder cone which exploded one day from the cornfield of a bemused local farmer. My imagination kindled into anxious heat; I became convinced that my life was in imminent danger from unexpected volcanic eruptions. Each night, I went to bed fixated on the ground below—bed frame, flooring, basement, foundation, the dark earth that lay beneath it all and could turn deadly at any moment. I taught my fellow first graders to feel the blacktop in the school yard at recess to see if it was hot, one of the first untoward signs that Parícutin had been about to spring into existence in 1943. (Unfortunately for us, sun-warmed blacktop is always hot.) For years, the specter of the unforeseen volcano haunted my dreams and my waking. The month I turned seven, my family of five moved across the country to North Carolina. I struggled with the move—missing my friends, my familiar neighborhood school, the first-grade teacher I was secretly convinced was a distant relative since she shared my mother's maiden name. After the move, my already-fraught nights became worse. Sleeping on the second floor didn't keep the fear of incipient volcanoes away. My dreams were almost always nightmares, haunted by lava explosions and giant bugs and fierce creatures with sharp teeth. At seven, I knew I was too old to demand much midnight attention. My parents had their hands full with two younger brothers, one of them a difficult baby who never slept and refused to be put down. But I couldn't help it, couldn't stop the night terror from creeping in on me as soon as the lights went out, strangling me in its claustrophobic grip. For the better part of a year, I slept on the La-Z-Boy recliner in my parents' room—stealing in after one of my nightmares, stealing back out again when the sky had lightened. Even now, almost ready to close out my third decade on this planet, I sometimes wake in the night in the grip of the old unease, its familiar claws pressed delicately against my throat. These are the things I think about as I hear the pounding of Kate's feet as she races through her darkened bedroom and flings herself to safety under the covers. I feel caught, in these moments, between past and present, then and now. I am both the exhausted mother who would move heaven and earth to have her child just go to bed and sleep through the night for once in her life, please—and the frightened daughter, pressed against her mattress by the weight of unshakeable fear, praying to God to keep wolves out of the house and feeling the blacktop at recess to assess the likelihood of emerging volcanoes. At night, when Kate pulls me from sleep screaming incoherently about something that's hunted her through dreams, the anger that simmers underneath the surface no matter how many deep breaths I take (please, please, just let me sleep!) sometimes erupts. And, yet, at other times, I feel the exquisite empathy that comes from knowing exactly, deeply, physically, what it is to be the one called into wakefulness by the insidious touch of fear. It's difficult, knowing that there must be a balance between my needs and hers—parents exhausted beyond all reason are generally not excellent parents—and yet also that her needs are real, that the anxiety that propels her out of bed over and over through the night is a thing as valid as the way she lines her toys up in rainbow order before she plays with them. This fear, I know, is not bad behavior or entitlement. It's at once an integral part of who she is and wildly, dizzyingly, out of any of our control. As the whimpers from the other room finally fade, I sink onto the sofa I'd been sitting on before Kate barreled in with her tears and immediately-forgotten stall tactics. I clutch a mug of warm tea and feel myself freefall into my own, grown-up worries. Was I too harsh? Too lax? Not listening enough to my child's needs? Listening too much and neglecting to lay down the law? I lay my hands against the blacktop of my own heart, feeling the lava bubbling there still, the irritation that lingers in my skin and my breathing. At least this time, I think, I've kept the worst of the eruption at bay: the yelling, the impassioned and instantly-regretted threats to lock her in her room if she can't stay in there, the way words come out of me sometimes and leave me in their wake, wishing I could call them back. Wishing, perhaps, that I could return Parícutin to a cornfield, placid and untroubled. Peles Moonlit Dance by Sue Kohler. See more of Sue's work on her website puaarts.etsy.com. This, I suspect, is the secret at the heart of all parenting—the thing we don't whisper at baby showers, the thing that nobody believes until they are deep in the trenches of their own personal parenting hell, the dirt of it beneath their fingers, the panic pounding in their blood. It is this: that ultimately, we each make it up as we go along, never knowing what's truly the best course of action, wavering always between our convictions and our frail humanity. We are each always both parent and child, living parallel lives, forever touched by the memories that crowd in on us of our own anxious nights. Tonight, when I slip between my own sheets, I know that we will be the same, Kate and I—each of us held beneath the weight of our fears, the things that chase us through the dark hours, the anxieties that only change their faces as we age, but never truly let us go. A few hours later, before I go to bed myself, I steal quietly into Kate's room. In the darkness, I can see only shapes of things: the dresser looming in the corner, the nightstand next to the bed piled with a haphazard assortment of toys and books and cups of water. A white noise machine whispers as I pad gently across the floor. She's tangled in her blankets, cocooned around Petunia the stuffed elephant. I lay a hand butterfly-soft on her back, feeling the rise and fall of her breath, the storm and fire of a personality far too big for its body gentled in sleep. In these moments, the stillness and the dark, I feel so much love for her it's enough to split my heart in two. Beneath the anger, beneath the frustration spilling from me as unstoppably as any natural disaster, what I feel most is worry: Worry that this anxiety will haunt her through her life, that the imagination that peoples her world will also make it dangerous and terrifying. More than anything, I want her to feel joy, expansive happiness, peace. Still. Perhaps it is enough to know, when she wakes screaming in the night, that she's not the only one. That she is never alone, even in this. I fix the covers around her little body, press a soft kiss to her hair, and tiptoe back out of the bedroom. Sue Kohler is a fine arts nature photographer and it is her intention to share the beauty of Hawaii’s Big Island with all of you. She calls her business PuaArts. "Pua" is Hawaiian for “flower”. The flowers were her first love in photography and on Hawaii’s Orchid Isle the flowers are breathtaking and always her inspiration. Kilauea Volcano is ever present, constantly putting on a dramatic show of her power to create worlds. 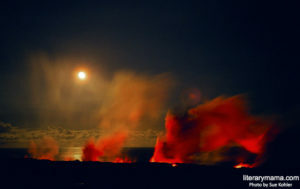 With great respect and caution, she captures the beauty and force of Hawaii’s volcanic eruptions. Sue has been fortunate to live in this beautiful place for over 12 years and it's been both a joy and a privilege. Her work has shown in prominent galleries throughout the Big Island and has sold worldwide.